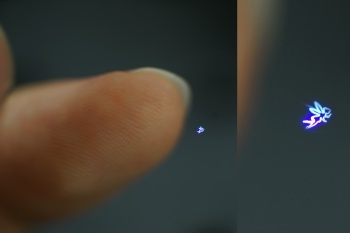 Japanese researchers have created a hologram of a fairy that you can touch and feel, thanks to femtosecond laser technology. Let's just hope they leave the safety protocols on - researchers have taken another step closer to the reality of Star Trek's Holodeck technology with the invention of a tangible holographic image. The hologram - a minute blue fairy - is produced by using femtosecond lasers to agitate particles in the air at a particular point in space, while simultaneously creating the desired image. A human feels the agitated particles as if there were a solid presence, though they can still pass through it harmlessly. Star Trek's holodeck, meanwhile, was a staple of the series from the first episode of The Next Generation. Inside the holodeck, holographic projections could be touched and interacted with like any real object. Safety protocols kept any dangerous holograms, such as tommy guns, in check - except, of course, when they didn't. Apart from simulating gangster novels for starship captains, the technology could have more immediate, practical uses in the up-and-coming field of holographic interfaces - computer keyboards made of light beamed onto the surface of a person's lap, for example. As impressive as holographic interfaces can be, humans use touch to confirm the input that their visual and auditory senses provide them. A keyboard made of light may be be a fascinating and portable tool, but the disconnect between using an object and not feeling it can put people off. More future technology from The Escapist. Not any longer, say the scientists. With this technology, that keyboard will provide tangible input to the fingers on its keys; you can check a box in mid-air and feel pressure on your fingertip to confirm your selection. Taken further, you can video-chat with a loved one and touch their hand; play a virtual game of solitaire and feel the cards as you deal them out.